Stuff made for Christmas 2004. Well, the 2004 crush is finally over! I got started a couple weeks later than I wanted to, due to a nasty flu. Still, I managed to get quite a bit done, and had a lot of satisfaction in the different types of projects. As usual, I didn’t get pictures of a few things (and, yes, I cursed myself soundly for forgetting). BUT things got done on time, and I was finished on December 23 (much better than last year’s 8PM on Dec 24!). Once again, this season’s gifts were heavily oriented to the intarsia side of things, but included monogrammed boxes and puzzle boxes. The puzzle boxes (not pictured) are simply a box with 6 interlocking sides and no obvious way to open it … the trick is to get the box open, somehow. My nephews claim to have opened theirs in 10-15 minutes (of course, the prize of money inside no doubt sharpened their wits). My wife and her sister rattled away at theirs for considerably longer (their prize was chocolat)! The wife got hers open (phew! ), but her sister still hasn’t figured it out (tee hee). Not pictured is hand-held table-tennis game that I made for my nephews. The object is simply to bounce a ping-pong ball back and forth on the playing surface for as long as possible. Simple, silly, but not as easy as it seems. Two nice intarsia projects not pictured are a styalized owl head (eyes + beak + part of the face), and a castle. The latter was a 3D sort of thing, and looked like the castle tower was being pushed out of the frame. The dated ornament for this year. 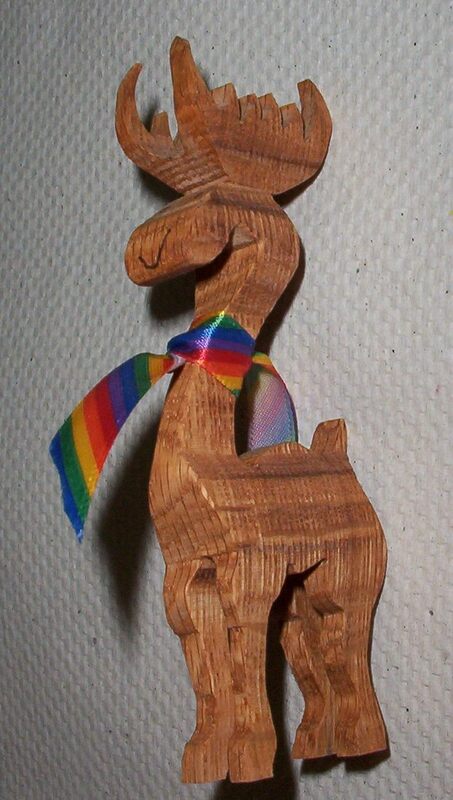 It’s about 4-inches tall, and is made out of 1/8-inch baltic birch plywood, with a natural oil finish. This intarsia dragon was done for my wife. It’s about 13-inches wide, and 4-inches high. The tricky bit was shaping all the pieces to not look so squarish, but the hardest part was getting the tail wrapped around the front. The wood is 1/2-inch cedar, and I got the different colours (on the gill and underbelly) by doing a wash with acrylic paints, and finished with a natural oil … turned out not too badly! 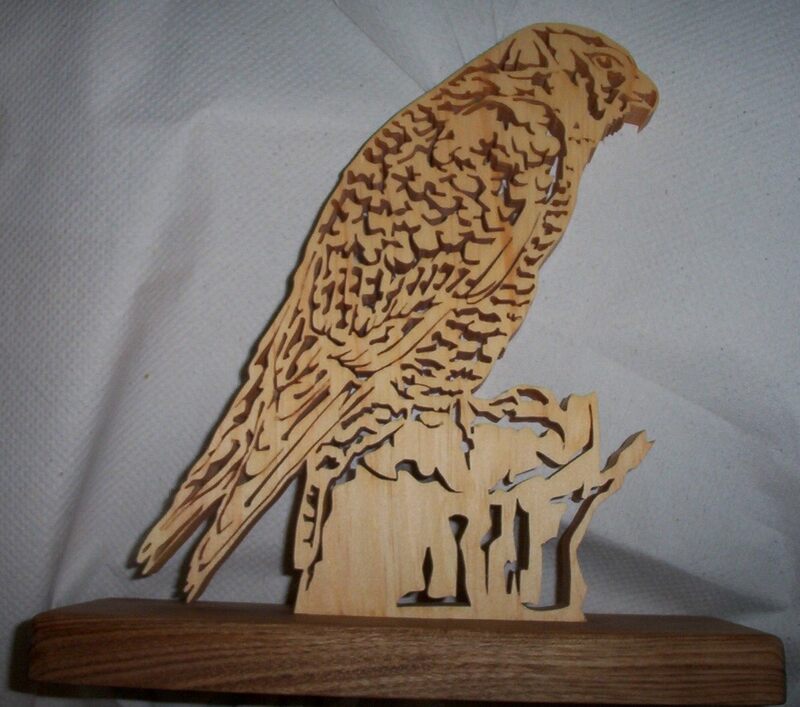 This is a fretwork falcon, standing about 10-inches tall (about full-size, actually). This one is made from 3/4-inch pine, finished with a natural oil. I made a bunch of these reindeer, which stand about 3-inches tall. 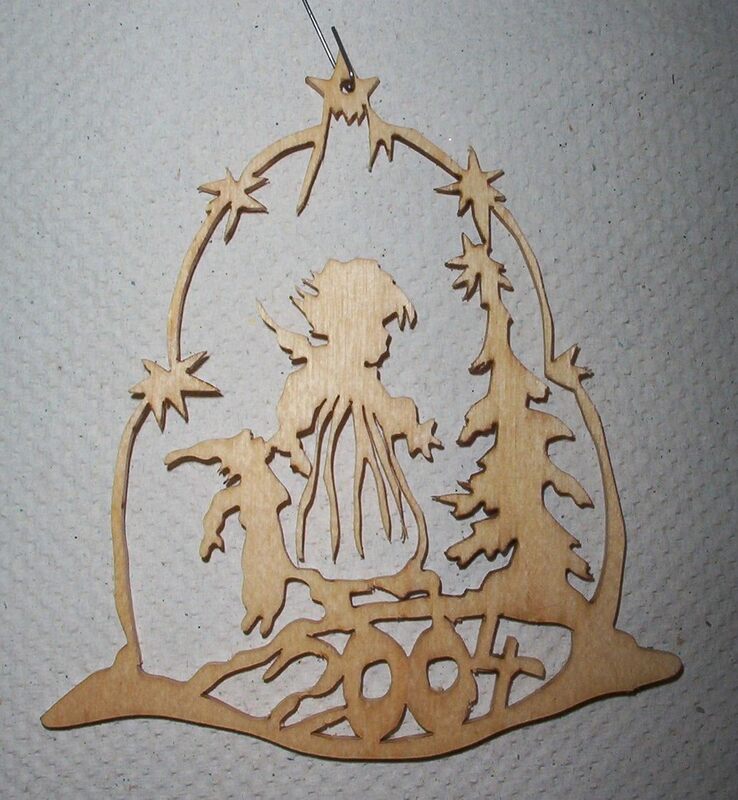 These are done using a technique called “compound cutting”, where the shape is cut on the scrollsaw on one side, then it is flipped over and then cut from the adjacent side. The scarf and goofy smile were my own ideas. 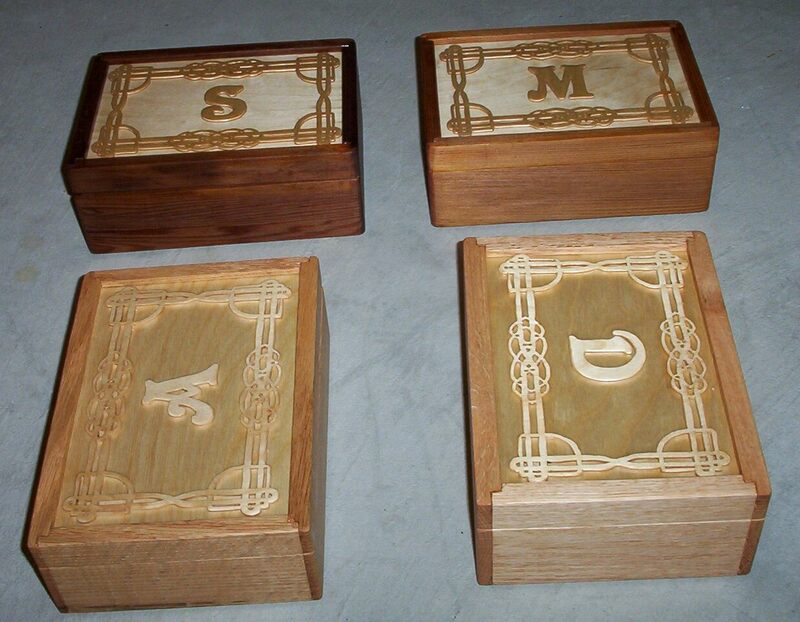 These boxes are all 3x6x9 inches in size, and feature a fretwork pattern on the top with the person’s initial. Two boxes are made from cedar, and the other two from oak. The tops (and scrollwork) are 1/4-inch baltic birch plywood. The finish is a natural oil. Oh, and the wood on the bottom right box actually matches very well, but the flash makes it look very mismatched. 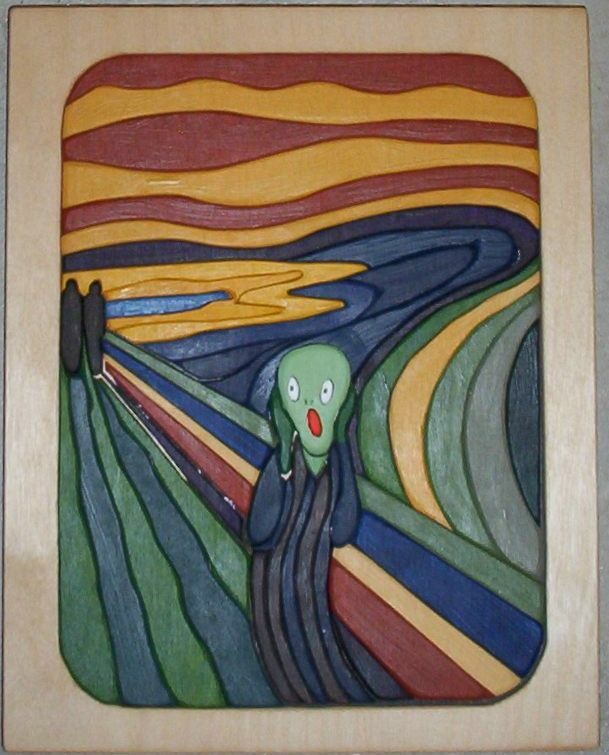 Here’s an intarsia version of the famous painting, “The Scream”. Each piece is painted with acrylic paint. Getting the correct colour was quite a challange, and I came away with a MUCH better appreciation for the colour-sense of the original artist … the colours aren’t random, but are rather very “quantized” blendings of one colour into another. Oh, and I “improved” the painting by making different parts of the piece different heights … the screaming figure is the highest, the “bridge” portion the second highest, and the background is just that. 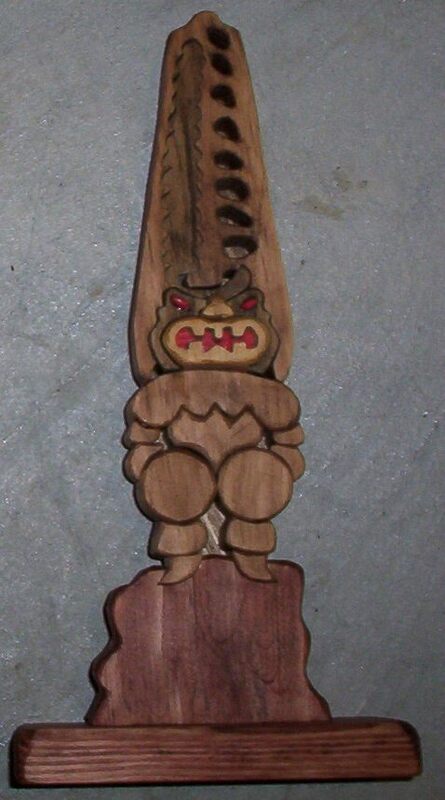 This intarisa “war god” is based on an Hawaiian design. It is made from 3/4-inch pine, and stands about 10-inches high. The eyes and the inside of the mouth are painted, and the rest is finished with a natural oil.